Back in the day before Samsung took over the Android world the original HTC Desire was the handset that put the company firmly on the smartphone map. Things have changed somewhat since then but the brand lives on as the HTC Desire 500 gets a Taiwan release date with its features detailed. Previously the company has been busy with another more affordable option in the form of the HTC Desire 600, but now it has announced another device that is being aimed at Taiwanese students. The HTC Desire 500 features a 4.3-inch touchscreen display at a resolution of 800 x 480. Under the hood is a quad core Qualcomm Snapdragon 200 processor clocked at 1.2GHz which is paired with 1GB of RAM, and on board storage comes in at 4GB but luckily there is the option of expanding this by another 64GB via a microSD card. Despite its more affordable price range the device still features an 8-megapixel rear facing camera, which is coupled with a 1.6-megapixel unit around the front. The 1,800 mAh battery is promised to provide owners up to 17.8 hours of 3G talk time or 401 hours of standby. The handset will come with the Android Jelly Bean operating system that will also include the HTC Sense 5.0 overlay, which also includes BlinkFeed. The HTC Desire 500 measures 131.8mm x 66.9mm x 9.9mm weighing 123grams and is priced at NT$11,900 with a release due on August 1st. 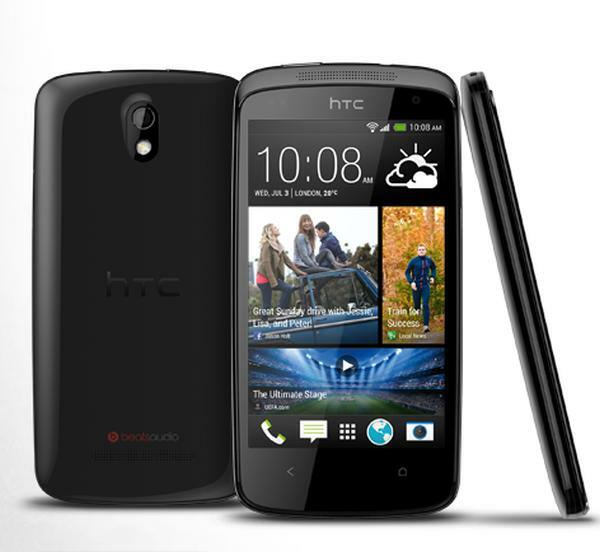 Do you like the look of the HTC Desire 500?